I am convinced if we want to become not just writers but influential writers, we must follow certain steps in our process to greatness. As in any worthy endeavor unfulfilled expectations usually means we ignored basic principles or were too lazy to carry them out. Unfortunately, no easy way exists to reach our desired goals. We have to toil, sometimes unceasingly, until we finally step into the realms we’ve stretched ourselves to attain. I’ll admit some seem to achieve the final reward a lot faster and with less effort than in our own little world. I suppose they were born with intuitive understanding of the process or maybe even a little bit of luck. That’s okay. Those who labor diligently often appreciate the achieving far more than those who barely have to lift a pinkie. And then there are those who, no matter how hard they try, fail to achieve the heights they want to attain. That reminds me of the story about a man who couldn’t pitch a baseball despite his urgency to achieve that feat. So every day he found himself out back where he threw baseballs against the barn, over and over again, until he learned how to pitch with some degree of talent. The same can happen for us, and it doesn’t matter at what level we begin. The steps to receive this potential to become are the same in whatever goal we want to achieve. We might excel in one category more than in another. But the good news is we only have to remember three things and then work like mad to accomplish them, especially the first two. Learn all we can – That seems logical, right? If we want to become an accomplished writer, we have to understand everything about that craft. Learn about sentence structure, grammar, tone, style— the list goes on. We may be proficient in some, not so talented in others, but that is where the next step comes into play, the step I mentioned above. Act on what we learn – We can learn all we want, but until we practice the information we glean, those facts lay dormant inside us or perhaps fade away altogether with disuse. The one thing I have learned in my pursuit to get published is this: If I fail to send my manuscripts to readers or to agents, I never improve, and I never get published. Yet some of us expect results, dream about the final reward, without putting in the time. I’m sorry to break the news to you, but if we ignore this step, most likely we’ll continue to dream and never receive our ultimate reward. Those who do make the effort can’t help but fall into the last step toward distinction. After gaining knowledge and after all the hard work and practice, we suddenly discover the potential to become. We might say the seeds, talent, or whatever we call this ability, awakens inside us. Whether that capacity was present all along and just needed a little coaxing, or the powers are given us from a source far greater than our own, we finally comprehend the goal is within our grasp. It is attainable. And that potential pushes us to even greater levels than we first set for ourselves. That’s it. Three easy steps, right? We just have to set our minds to it. Learn all we can and then practice. Now that I’ve taught you the process, go and become the best you can be. And when you achieve far more than you expect, just remember where you learned the sage advice. There’s more where that came from. I’m in the process of practicing the steps myself. My latest novel is an archeological mystery/suspense about finding buried treasure. The story weaves science, religion, and Native American folklore together to catapult the protagonists into mayhem and toward a find promising to change the face of Christianity. My inspiration came after attending lectures of three well-researched men: Rod Meldrum, Wayne May, and Bruce Porter. They introduced me to the subjects of the Michigan Relics and the mound-building civilizations of North America. 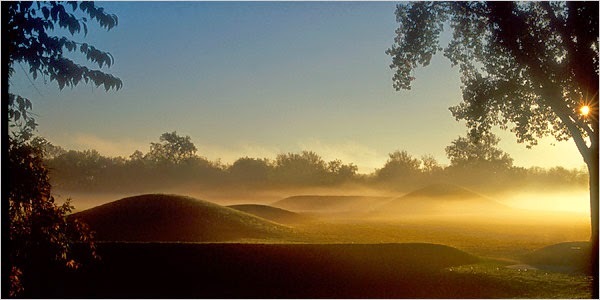 Imagine my surprise when I learned of hundreds of thousands of Native American mounds along with their artifacts and skeletal remains scattered throughout the United States long before the European nations invaded this country. These were the vestiges of cities larger than Rome or London, yet barely earning a footnote in the annals of America. My elementary and high school teachers were either ignorant or knowingly mute about such subjects, thanks to the political agendas of religious and scientific institutions and the attitude of the Manifest Destiny. America’s educated have buried the evidence or destroyed the earthworks until nothing of substance is left to understand who built them or what happened to these civilizations. The tablets and artifacts that do exist tout philosophies of Old World cultures and suggest these people arrived in this land from across the Atlantic Ocean. Many of the relics display ancient Semitic and Egyptian writing. The colonizers used copper and iron processes to craft tablets, head plates, breastplates, and swords. Academia has deemed most of the relics fake and the mound constructions too sophisticated for the "primitive savages" who once existed across this land. It’s America’s best kept secret, and Meldrum, May, and Porter site a powerful case in their research. Hopefully, I have succeeded to relay their message adequately in my work of fiction, and those agents who review the manuscript will find it a topic worthy of consideration. I am passionate about the subject. With a little luck, my readership will find it as fascinating as I have. I just finished a major rewrite of my latest novel. Each successive version of the piece comes closer to what I had hoped to glean when I started, yet I ask myself, “Is a writer’s job ever finished?” Eventually I just have to abandon the effort, except my imperfections, and move on to my next endeavor. But when do I place my baby on the stranger’s doorstep and run? My writer friends tell me revision is necessary and to edit my work until it is right. If you are like me, I pick my prose to death. I’m never quite satisfied with my sentence structure or my word choices. Often, when I change things, I add additional mistakes without realizing my error. Years can go by before I even allow others to read the manuscript, and then a day after I send it off I’ve already changed the story. I lament, "Why didn't I wait until now?" My problem is I don’t want others to see my imperfections. I envision my readers rolling their eyes and muttering to themselves, “What was she thinking? And she calls herself a writer!” But I can’t please everyone. It’s imperative that I rely on fresh eyes and fresh perspective to shake the kinks out of my writing. Neither do I know all things and allowing others to peruse my words can only improve my work. All writers must become reptiles. They must don a tougher skin. Accepting criticism and acknowledging their lack is part of their craft. Unfortunately, no other way exists to achieve a higher level of accomplishment. Still, the thought of someone’s corrections stabs me to the core. I better scour my closet for that thick skin over-suit. Hmm… now where did I hang it last? In February, I attended another mind-enriching American Night Writers Association conference in Mesa, Arizona. The keynote speaker was one of my favorite Regency authors, Sarah Eden. The woman is an enigma to me. Challenged with disabling arthritis that will affect her body the rest of her life, she faces the future with faith and encourages other writers to do the same. Over the last month, I have reflected on the comments she left with us. They are fodder for the most discouraged of authors and have encouraged me to face the future with a different frame of reference. I share her thoughts in bold type below and have included my comments on how her points have molded my thoughts. Don’t confuse lack of experience with lack of ability. As I anticipate building my platform and producing books that will appeal to a vast audience, I often cower and fail to attempt a project that will advance my writing career. I let the challenges of such lofty goals intimidate me until I believe I am unable to learn the tricks to advance my writing and platform strategies. The facts are: We can all become skilled if we at least undertake something new. We may not be perfect. We may make mistakes. But with each bite of the proverbial elephant, we discover we have more inside us than we ever anticipated. Don’t expect a gourmet meal on a fast food timeline. Perfection takes time. If I put forth the effort and attempt a new story, I might as well take the time to make it right. I’m rather an impatient person. I want to see results quickly. I sometimes skim over the necessary steps in my haste to the reach the end product. Eden says, “Great art always takes time.”And my experience has proven: working on somebody else’s timetable never produces the results I desire. So who says I have to write as fast as another author? Who says the faster I write, the better my work will be? I’ll be much more satisfied if I use my time wisely and work until I get the piece as perfect as I can make it. Don’t approach writing the way you approach Halloween. We have to be ourselves. Joining trends or adopting someone else’s writing style only keeps us from discovering our unique voice. We can never really copy somebody else’s success anyway. We must build our own worlds, find our own strengths, and start the next trend. Don’t assume critics know what they are talking about. On the other hand, some critics are accurate in their assessments. But criticism must be ingested with a discerning palate. We will never please everyone, and judging by the way some writing is accepted by the public, criticism, or lack of it, is not an accurate science. A good way to determine whether we should heed solicited or unsolicited advice is to follow only those judgments that continue to surface from many different sources. Just don’t take to heart the manner by which some critics dish out their remarks. Disparagement, in all its forms, holds different weight in different circumstances. Don’t start polishing your Captain America Shield. Most of the time, I am my harshest critic. Hopefully I’ll never fall into this superhero worship of anything I do. We all must grow. None of us, at least the last time I assessed the menagerie of authors in the field, are perfect. We build our skills one line at a time, correcting one mistake at a time. Don’t take to the field if the marching band hasn’t arrived. We need each other in this insane goal of building worlds so others can enjoy them. Never believe you have to attempt the task by yourself. Join a writers group. Let others read your work and help you make your product better. If you don’t know how to build your platform, find someone who does. Nothing is beyond your reach when you surround yourself with friends. Don’t ever assume the zombies can’t find you. The hideous comments Sarah Eden has received from tactless individuals over the years, left me with my mouth agape. No one has the right to crush the life out of anyone endeavoring to become the best they can be. Yet, the world is a cruel workshop, and people have lost the art of kindness. So how do we keep our shield raised as we cross the battlefield? Eden suggests we plan to react or take hurtful comments in stride. At our most vulnerable moments, we should turn to our friends. Nothing can rid us of the sting of harsh judment, but we can make a valiant effort to deflect the assaults, even if we prefer to knock our assailants on their backsides. Don’t forget why you started the journey in the first place. In the midst of the battle, I often forget the joy and excitement of my beginnings. We are all aware of the difficulties of writing. Even though I’ve experienced the loss of a contract and have failed to meet the objectives of publishing one of my novels, I can’t allow myself to forget how much I love to write. Creating is everything to me. Odds are if I keep at my goals, I will eventually succeed. And if I don’t succeed yet another time, I’ll keep moving forward anyway. Maybe my family and friends will be the only ones to read my thoughts and taste of my creative voice, but I have gleaned a lifetime of enjoyment and learning from my craft. Eden ended her address with a quote from the French Impressionist painter, Auguste Renoir. Renoir suffered from arthritis and struggled to paint masterpieces despite his infirmity. His dear friend and colleague, Henri Matisse, after watching Renoir work through a grueling painting session, confronted him one day. How can we forget such a profound reminder that whatever our challenges as writers, we must continue the journey to reveal truth and beauty, even if our attempt is only for ourselves. With every New Year, the priorities I want to achieve force their way to the front of my mind and toy with me, tempting me to take on more than I can accomplish. I want to write, to do genealogy, to exercise, to lose the six pounds I gained over the holidays, to be done with braces on my teeth, to get through another year of work without losing myself in the hubbub. This is my last day of vacation, and as I anticipate Monday, a swell of nausea roils inside my stomach at the prospect of work. I’ve enjoyed two weeks with my dad and my sons, cleaning out closets, decorating and taking down decorations, going to parties, and eating until my belly sags. The sad fact is I want to do too many things and, because I’m a working girl, vacation is the only time I can pursue all I enjoy with any quality of time. I suppose I should set goals: set a schedule to write, even though I’ve neglected my dream of being published in the pursuit of my family roots last year. Perhaps an analysis of my spare time will produce a few more minutes to use wisely. I’m aware the unpredictability of caring for my elderly father can rob me of those spare seconds, but there is always extra time if you look for it, right? So, without excuse, I pledge to write a little every day, starting with this blog post. I have two novels in rewrite, one novel midway in process, and another two waiting for attention. Surely, they are more important than watching television or sleeping past 5:00 am. Maybe by next January 1st, I’ll have more to show than mere promises to myself.